Fun fact: a gyrfalcon flying at 200 mph hits HARD. Plus, it likes to pluck the feathers from birds it kills. So in the spots where a gyrfalcon has attacked, it looks like a bird exploded. Exhibit A: this picture of me taking a GPS point at what I will now refer to as a feather explosion. Which should be a scientific term, of course. If sea turtle biologists can get away with calling their capture attempts a turtle rodeo, I can call a place that looks like a bird spontaneously detonated whatever I want. I am, however, amenable to suggestions if someone can come up with a better name. I actually didn’t know this was something that happened until I came up here, and this kind of behavior is really lucky for me. When researching the connection between carnivores and prey like I’m doing now, it is helpful to know where the actual risk of being captured and eaten is highest. Vocabulary time: this is something called a non-consumptive effect. For the purposes of making it clearer for non-scientists, I will from now on in this post refer to it as the Batman effect. Prey species, much like criminals, are a cowardly and superstitious lot. Much like how Batman’s watch over Gotham City causes criminals to change their ways out of pure fear, an animal with the knowledge that it could be eaten at any moment can dramatically alter its behavior. So we know that it’s possible for ptarmigan to change their behavior based on whether there are gyrfalcons nearby. We already know that ptarmigan will dive for cover and freeze in place when a falcon flies overhead, which makes it difficult for the predator to see them. To compensate, a gyrfalcon can fly low to the ground to scare a ptarmigan into an attempt to flee. 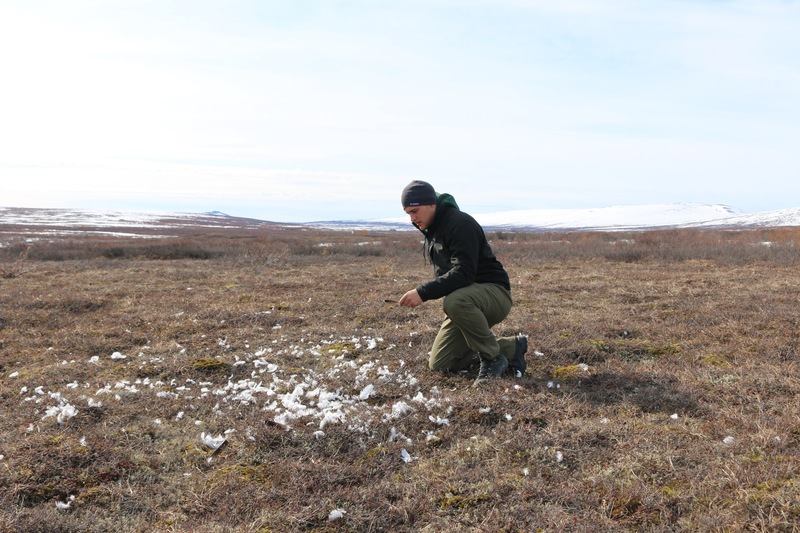 What we don’t know is whether the risk of a ptarmigan being caught changes across the landscape. Is a bird more likely to be killed near a gyrfalcon nest or far from it? Do they shrink away from where kills are concentrated? Is there a kind of habitat where gyrfalcons prefer to hunt? Lots of questions, and no answers. Sad for a politician, but exciting for a scientist. With this in mind, I get to play detective and hunt for crime scenes (a.k.a feather explosions) as part of my research. If I find enough of them, I can construct a map of the places that are most risky for ptarmigan to be. That allows me to discover how the Batman effect is influencing ptarmigan. It’s not as exact as it could be, but it doesn’t need to be. This small segment of my work is a pilot study. It gathers enough information to back up my hypothesis for when I propose more in-depth research and keeps people from laughing me out of science.